When does social networking move from pleasurable to a pain? When did it change from something that you nip onto in a spare five minutes, to being something that you constantly maintain and check? I first entered the realm of social media with Myspace. It is so long ago now I can't even remember what I did there, but it wasn't anything that was particularly addictive, or fun. From Myspace I was encouraged by a friend to move to Facebook. So it began. Fast forward through to 2013 and I have Facebook, Twitter, Google Plus and a blog. How did that happen? I'm not even sure myself but I know that a chunk of my time is taken maintaining or checking these sites. How profitable is it to me however? Looking at each one and the reasons I am there, it becomes easier to see how you can get caught up. Facebook is used to catch up with friends. It was the first of the social networks to go global and it is still the most popular, thereby being the one that you can still catch up with most people you know on. It is however also massively irritating, although more down to the things people post as opposed to the site itself. Baby pictures, quotes, it's just not interesting enough to hold my attention. That took me to investing Twitter. I joined Twitter to find like minded Formula One fans. It has grown into an addition that I don't want to quash. I love my Twitter and I'm keeping it. Google Plus I was forced into having when I changed my email to a Gmail Account. I ended up using it for blog purposes but don't use it for any other reason. I see fail to see the point of it but somehow, I still end up having a look 2-3 times a week. The last of my online addictions is of course this blog. This is the place that I spend most time on and many many hours have been spent in maintaining and adding to the blog. I don't regret these hours however as the blog gives back to me as much as I give it. This is however how you end up with so many internet commitments. I have managed to justify all of mine, quite easily. I think that as long as it doesn't interfere with your working life, and you have a social life outside of cruising around Twitter, there isn't a problem. Sometimes I feel like I'm being stretched by the internet, that's when I remind myself to stay involved in life outside the world wide web. 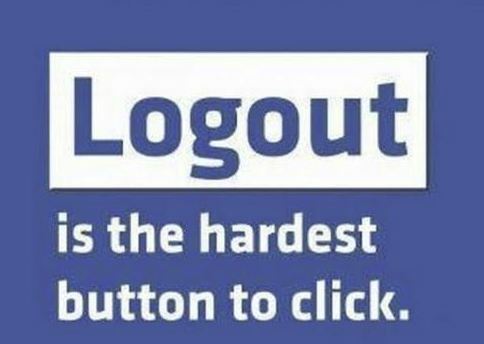 Thanks for the visual reminder to Logout! I find that if I am not careful I can spend all night on the internet with no face to face interaction with anyone! Sometimes we all need a reminder to log out?